An Avalon Park woman is accused of brandishing a handgun during a post-Pride Parade confrontation outside of Kirkwood Bar, 2934 North Sheffield. 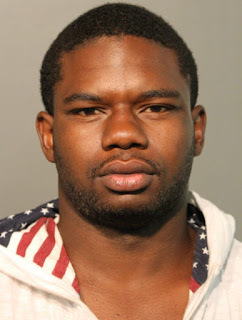 A 22-year-old parolee from Englewood who allegedly choked the woman is also charged in connection with the incident. Callers reported a woman waving a gun while arguing with a man in the street around 9:45 p.m. Sunday. Arriving officers found Deanna Vaughn sitting in the driver’s seat of a car with a semi-automatic handgun next to her foot, police said. Vaughn told cops that Derrick Pouncey had choked her, saying “this ain’t what you want,” which she took to be a “threat of violence,” according to court records. Pouncey, on parole for a narcotics violation, is charged with battery. He was previously sentenced to prison for unlawful use of a firearm, state records show. Police say he is a Gangster Disciple street gang member. Vaughn is charged with unlawful use of a weapon, possession of a firearm with a defaced serial number, possession of ammunition without a Firearm Owner Identification Card, reckless conduct, unlawful use of a weapon on a public street, and various traffic violations. Her Facebook page indicates that she was getting ready for Pride in the days leading up to Sunday. A judge set her bail at $75,000.